Today is the first Friday of the month. If we were living in the Thirties, a new issue of The Spider magazine would be hitting newsstands today, such was it’s publication schedule. In fact, 71 years ago we may have shown up a little early, rushing to our local vendor in anticipation of “The Spider at Bay,” the second chapter in a continuing story — a rarity for The Master of Men. Would Richard Wentworth finally defeat the dreaded Black Police this month? The title didn’t sound promising. Today, of course, you don’t have to wait another month for the ending — you can buy the “Black Police Trilogy” complete in one book: The Spider Vs. The Empire State! 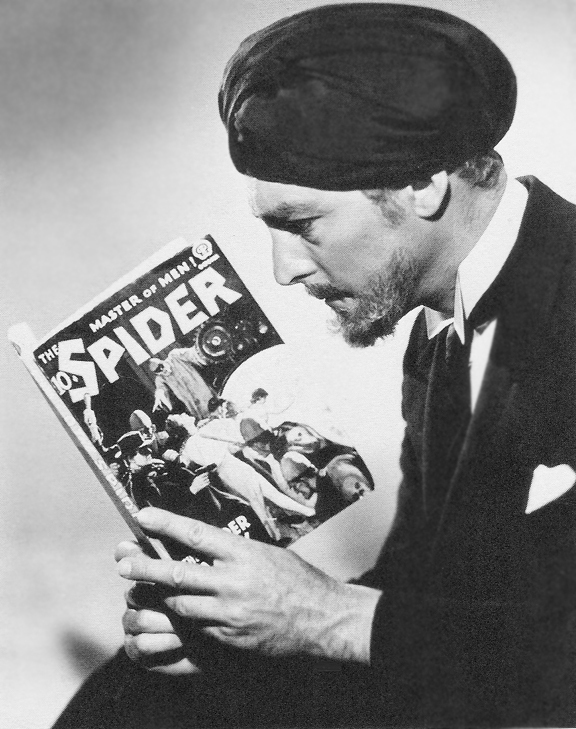 Another cool thing to think about, if it was the first Friday of September in 1938: As we clutch our mint copy of “The Spider at Bay,” principal photography for the first Spider serial, The Spider’s Web, had only just started on Monday! And — as Ed Hulse discovered fairly recently — star Warren Hull had only been cast one week ago, after John Trent dropped out at the last minute. You have to wonder if The Spider’s Web would be considered one of the top cliffhangers of all time without this genius stroke of recasting — and if Hull himself would have gone on to embody other serial heroes such as Mandrake the Magician or The Green Hornet? Bringing it back around to the “The Spider at Bay” … As this was the current issue of The Spider at the time, it is this magazine that figures prominently in The Spider’s Web photography and promotional materials. At right is Kenneth Duncan, who so ably played Ram Singh in The Spider’s Web and The Spider Returns, posing with the story that we just reprinted in Empire State. 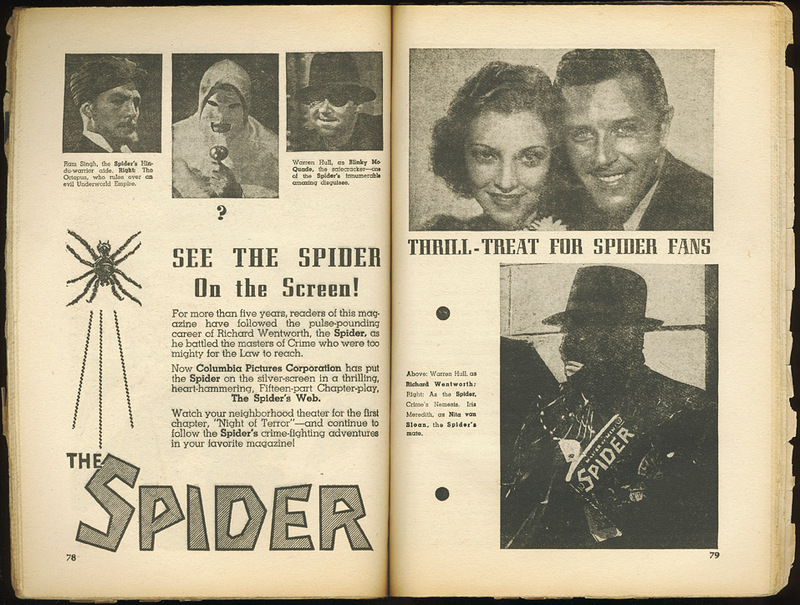 According to the Web promotions book, there were five stills of the actors posed with The Spider magazine to capitalize on the title’s popularity. Personally, I’ve only seen the Duncan portrait, and one of the Spider used in the magazine’s own two-page ad for the serial, pictured below. This ad ran in the January 1939 issue, which, as you probably guessed, hit newsstands on December’s first Friday.